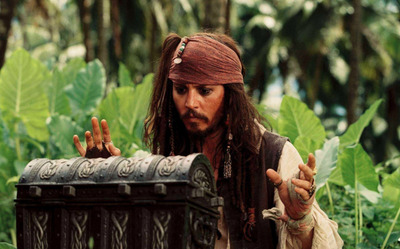 The “Pirates of the Caribbean” franchise is reportedly being rebooted, according to Deadline. While the films after the original have received terrible reviews and box office has decreased domestically, the worldwide box office has made them hits – meaning it was inevitable that we would get more. Last year’s fifth movie, “Dead Men Tell No Tales,” made close to $US800 million worldwide, and before that, “On Stranger Tides” grossed over $US1 billion. If you thought you had seen the last of the “Pirates of the Caribbean” movies, think again. Deadline reported on Tuesday that Disney is eyeing a reboot of the franchise with “Deadpool” writers Rhett Reese & Paul Wernick. Critic reviews have been rotten since the first film, 2003’s “The Curse of the Black Pearl,” and domestic box office has been lacking for recent movies in the series. But the franchise is still a huge hit worldwide, meaning it was inevitable that we would get more “Pirates” movies. The franchise’s five movies have made a combined $US4.5 billion, and a most of that has come from international box office. The second movie, “Dead Man’s Chest,” made over $US1 billion globally in 2006, as did the fourth film, 2011’s “On Stranger Tides,” despite a 32% critic score on review-aggregator site Rotten Tomatoes. Even last year’s fifth film, “Dead Men Tell No Tales,” still made nearly $US800 million worldwide. 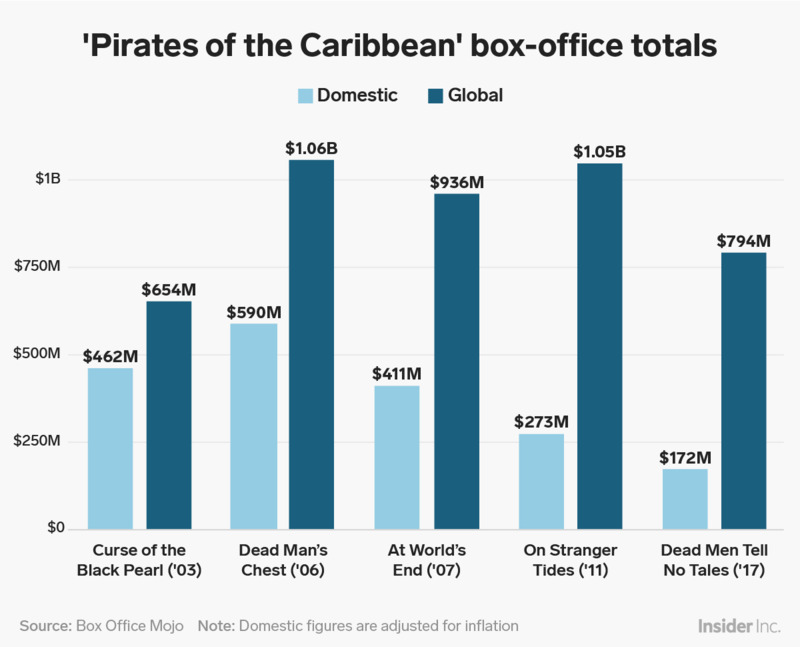 Interest among moviegoers has decreased in North America since “Dead Man’s Chest.” After that, each film’s domestic box office has been lower than the last, with “Dead Men Tell No Tales” only making $US170 million in the US when adjusted for inflation. But the strong global box office has ensured the franchise’s longevity, as international audiences have become key to the success of some movies that otherwise wouldn’t be hits. The biggest example besides “Pirates of the Caribbean” is the “Transformers” series. Last year’s “Transformers: The Last Knight,” which was also the fifth film in the series, only made $US133 million in the US, but $US605 million worldwide. The fourth film, “Age of Extinction,” made just $US277 million in the US in 2014, but over $US1 billion worldwide. A “Transformers” spin-off, “Bumblebee,” comes to theatres this year. 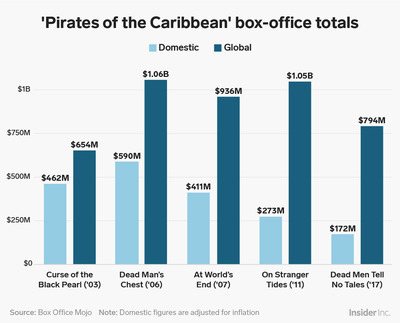 To show just how important global box office has been for the “Pirates of the Caribbean” movies, Business Insider made a graph that includes each movies’ domestic and global total.